If you have a home studio or produce music on a computer, sooner or later you'll realise you can't do without a MIDI keyboard. Why is that and what can it do for you? Learn about MIDI keyboards in this shopping advice entitled 'How to choose MIDI keyboards'. Important information for those who have not yet encountered MIDI issues is that MIDI keyboards do not contain any sound. As such, they do not play on their own. MIDI keyboards are actually controllers that send information on the height of the tone, dynamics, sound parameters, etc. and through which you play the controlled device. There are two types of devices you can play with MIDI keyboards: virtual (software) devices on a computer or hardware devices (e.g. a rack synthesiser) furnished with a MIDI input. However, you will most frequently use MIDI keyboards to play a virtual device, i.e. software devices in various music programs on the PC (Ableton Live, FL Studio, Cubase, Pro Tools and others). Depending on which instrument you choose in this program , the MIDI keyboard will then control this instrument: piano, organ, string instrument, bass, percussion, synthesiser. MIDI keyboards are unlimited in this respect – the only limitation is the number of instruments in your PC's sound bank. There are two main criteria in choosingMIDI keyboards. One of is the type of the keys, the second is additional features keyboard offers besides the actual keys. In general, the keys of MIDI keyboards can be divided into hammer action and synth action. Hammer action keys simulate a traditional acoustic piano. This means that they have heavier touch, a slower response and will suit mainly those who are used to playing on the piano. As such, the are suitable mainly for controlling and recording virtual pianos. The second and more widely used type of keys is synth action, which corresponds to the keys used, for example, on synthesisers. Compared to hammer action, these keys are smaller, smoother, lighter and have a precise reaction and a faster response and return (to their original position). They are ideal for recording electronic sounds, percussion, synthesisers, guitars, bass and other instruments. Compared to MIDI keyboards with hammer action, they are also considerably cheaper and can be appreciably more compact. When making your choice, you should also think about the number of keys you'd like to have. Two octaves (37 keys) should suffice for recording electronic sounds, synthesisers, beats or baselines. Keyboards with a range of 5 or more octaves (61+ keys) will be better for more sophisticated procedures, spread-out chords and piano phrases. MIDI keyboards with premium features are those with more than just a keyboard, i.e. all those illuminated, rotary, sliding, press-button and other elements. These include knobs (rotary potentiometers), faders (vertical sliding controllers) and pads (soft square buttons, often illuminated). None of these controllers has a fixed function and they can be assigned to various parameters based on the specific instrument on the PC that you use. For example, knobs can be used to control the parameters of synthesisers or effects. This control is more user-friendly and simplifies your work with the instrument without having to grab a mouse and clumsily shift the parameters on the PC. Thanks to their ultra-fast response, illuminated pads are convenient for creating and recording rhythmic patterns, with each pad assigned to a particular drum sound. Another frequent use is launching samples and various effects sounds. Therefore, if you plan to produce mainly electronic music, the following types of controllers will certainly prove useful. Today, the vast majority of MIDI keyboards are connected to the PC through a USB port. Current technology mostly enables plug and play, which means that the computer (PC and Mac) immediately recognises the keyboard once it's connected, so you'll be able to play right after launching your music software. Where can I find music software (DAW)? The majority of MIDI keyboards come with an intro version of. a production program for creating music on your PC. One example is Ableton Live Lite, an intro version of the popular software. 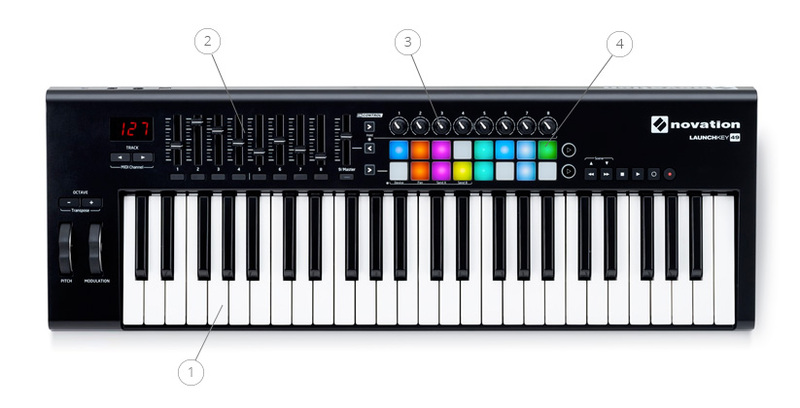 These intro versions will help you learn and take your first steps with MIDI. In the future you'll be able to upgrade these programs to the professional versions for a fee. What is included in the purchase and what will I need to buy? Is everything clear? If you have any questions, don't hesitate to call us on our toll-free line at 020 8089 1481, or write to us at .